A new meme or figure of speech has begun to circulate among conservative writers and thinkers with increasing frequency and appositeness—namely, that we are living in a world turned upside down, to cite the title of a major book by Melanie Philips, itself derived from Christopher Hill's study of revolutionary 17th century in England. (The term "world" is used by these writers to refer primarily to the Western sociopolitical domain or provinces thereof.) Almost everywhere we look we see this trope corroborated by extensive empirical testimony, of which I will flag only a few significant instances. It is a world, as we have just seen, in which respectable and knowledgeable anti-jihadist freedom fighters Robert Spencer and Pamela Geller are forbidden entry to the U.K. as disturbers of public order and social peace while avowed terrorists are welcomed into the country and allowed to live handsomely on the public dole. It is in this same benighted nation that anti-Sharia activists Tommy Robinson and Kevin Carroll of the English Defence League are arrested for entering a Sharia-controlled zone in Tower Hamlets, a borough of London, on their way to Woolwich to honor Drummer Lee Rigby, slaughtered by Islamic terrorists. 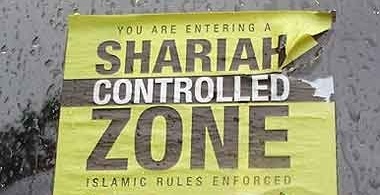 As reported on The Gates of Vienna website, "the Metropolitan police have now taken on the responsibility of enforcing the borders of these shariah-controlled zones, applying the rules laid down by the Islamic inhabitants." It is a world in which courageous media analyst Philippe Karsenty, who has shown beyond doubt that the infamous al-Dura event implicating Israel is an out-and-out hoax perpetrated by France 2 TV, finds himself convicted by the French courts for defamation—the Dreyfus affair redux. The Court of Cassation's decision to remand the case to the Court of Appeals, which had originally acquitted Karsenty and then overturned its prior verdict, is not only "outrageous," as Karsenty justifiably claimed, but legally problematic. As the JTA news source reported, "In returning the case to the appeals court, the high court said the appeals court had overstepped its bounds in ordering France 2 to send it the rushes of the report." In other words, from the perspective of the High Court, soliciting evidence is impermissible. Shades of Canada's Human Rights Tribunals and Supreme Court decision, which regard truth as unacceptable in their proceedings if it offends a member of a designated minority group. The same travesty exists in many European nations. It is a world in which the adherents of catastrophic global warming deliberately ignore the massively accumulating evidence to the contrary and politicians are inaugurating policies, based on a fraudulent and corrupted science, that promise to destroy their economies. It is a world in which powerful Democratic politicians in the U.S. oppose Voter ID laws on the grounds that such legislation would discriminate against black minorities. The facts that (1) I.D. is required for almost every other form of access to official institutions irrespective of caste or color, and that (2) the absence of such laws results directly in voter fraud and the skewing of electoral results, almost always in the Democrats' favor, are conveniently forgotten or intentionally suppressed. It is a world in which Iran chairs the UN Conference on Disarmament and Syria was recently a member of the United Nations Human Rights Committee. It is a world that has fallen in love with a manifestly false Palestinian narrative to which it unthinkingly subscribes and that adamantly refuses to consult the historical muniments that are readily available to any interested mind—in other words, a Euhemeristic world that interprets "myths as traditional accounts of historical persons and events" (Merriam-Webster). It is a world that insists on portraying Islam as a "religion of peace" when a prodigious number of its expressions in the theological canon, in the jurisprudential literature, and in actual and undeniable events on the domestic and international stages indisputably indicate the complete reverse. In this world, minority cultures and especially the Islamic community are, in effect, given precedence over the heritage cultures. Here the West could learn from Vladimir Putin who, in an address to the Duma on February 4, 2013, stated in part: "In Russia live Russians. Any minority, from anywhere, if it wants to live in Russia...should respect the Russian laws. If they prefer Sharia Law, then we advise them to go to those places where that's the state law...we will not grant them special privileges, or try to change our laws to fit their desires, no matter how loud they yell 'discrimination'. We better learn from the suicides of America, England, Holland and France, if we are to survive as a nation." Experiencing terrorist atrocities on our own soil; remarking how Islamic-inspired anti-blasphemy laws are gradually encroaching upon the bedrock principle of free speech; noting the rising incidence of Jew-baiting and antisemitic propaganda among Islamic groups and organizations; and witnessing the epidemic of Muslim rapes of non-Muslim girls and women in Australia, Britain and Scandinavia (to name only the most prominent examples), we know—or should know—that Putin is absolutely right. The ignominy is only compounded by the shameful response of our media and government apparatchiks who dismiss, cover over or explain away these abominations as the fault of an uncaring society that treats its immigrants badly. In Erewhon, for example, there are no machines (cf. our mounting legislation against successful industries in favor of unworkable "renewable resources"); coinage is trimmed (cf. our sinking currencies); offenders against the law are coddled as ill (cf. our pampering of lawbreakers as suffering victims of social indifference or oppression); the ill are regarded as felons (cf. the innocent are often criminalized); and so on ad nauseam. We live in a backwards world in which the decent are regarded as indecent, defenders of western institutions are considered as terrorists, correct naming is derogated and often prosecuted as slander and "hate speech," violence is justified if committed by our enemies, unseasonable cold weather is interpreted as an infallible sign of global warming—the beat goes on. It should be clear by this time that we have lost our bearings and have sacrificed both our sense of reality and our survival as a genuinely liberal culture on the altar of unreflected sentiment, a reluctance to deal with or even recognize unequivocal evidence, and a wholly mistaken conception of our fundamental interests. We have, for the most part, colluded in an agreement that upside down is right-side up, backwards is forwards, and madness is sanity, as if we had been stricken by the ideological version of the Black Plague. It is a world gone perhaps irreversibly mad, for certain forms of madness may be untreatable—in which case we are truly lost. Of course, the world has never been in its right mind, but we can say that the comparatively more enlightened sectors in the West have at least perambulated canzicrans, sideways like a crab. Today, sideways would be a blessing, for we are moving inexorably backwards—toward the infancy of the mind, toward the re-medievalization of power relations, toward cultural dissolution, toward a renewed primitivism issuing in civilizational suicide, in short, toward our contemporary Erewhon, our "Nowhere," which is also an anagram for: "Now here." This is a video with Paul Weston speaking on the Woolwich Killing, Islam and Modern Britain. Though a Muslim slaughtered someone on the street and stated clearly he did this in the name of Islam, the media denied it was connected to Islam. Weston makes the point that in the name of multiculturalism, Britain is becoming "minority white" in its own country. Britain is committing cultural genocide and the politicians see the influx of Muslim immigrants as a good thing. The English are told that they benefit from multidiversity, but Weston realistically sees little benefit from having to educate, house and medicate an ever increasing non-productive immigrant group.